The Pokémon awakens quickly from sleep. Steals an item when hit by another Pokémon. 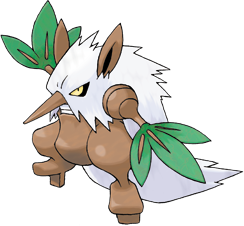 X A Pokémon that was feared as a forest guardian. It can read the foe’s mind and take preemptive action. 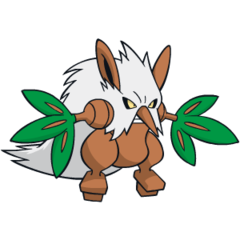 X Dieses Pokémon wurde als Wächter des Waldes gefürchtet. Es kann die Gedanken des Gegners lesen und präventiv handeln. X Ce Pokémon est le gardien des forêts. Il peut lire les pensées de ses ennemis et agir en conséquence. X Habita los bosques y se le tiene miedo. Es capaz de leer los pensamientos del rival y actuar en consecuencia. X Un tempo era un temuto guardiano della foresta. Sa leggere nella mente del nemico, anticipandolo. X 숲의 신이라고 여겨져 두려움의 대상이 되고 있던 포켓몬. 상대의 생각을 읽고 앞지르는 능력을 지녔다. Y By flapping its leafy fan, it can whip up gusts of 100 feet per second that can level houses. Y Seine großen Fächer erzeugen Böen, die eine Geschwindigkeit von 30 m/s erreichen können. Y D’un coup de sa feuille éventail, il génère des bourrasques de 30 m/s capables de souffler une maison. Y Con sus abanicos puede provocar vientos de 30 m/s capaces de levantar casas. Y Con le sue foglie provoca raffiche di vento della velocità di 30 m/s che spazzano via interi edifici. Y 잎사귀 부채를 부치면 풍속 30m의 돌풍이 일어나 민가를 날려버린다. Omega Ruby Shiftry’s large fans generate awesome gusts of wind at a speed close to 100 feet per second. The whipped-up wind blows anything away. This Pokémon chooses to live quietly deep in forests. Omega Ruby Tengulists große Fächer erzeugen Böen, die eine Geschwindigkeit von 30 m/s erreichen können und alles und jeden hinwegfegen können. Dieses Pokémon lebt still und zurückgezogen in den Tiefen der Wälder. Omega Ruby Les grands éventails de Tengalice peuvent déclencher des bourrasques de vent allant jusqu’à 30 m/s. Le vent déchaîné peut tout envoyer balader. Ce Pokémon a choisi de vivre tranquillement dans la forêt. Omega Ruby Las grandes manos con forma de hoja que tiene Shiftry generan grandes corrientes de aire que pueden alcanzar 30 m/s y barrer lo que sea. Este Pokémon opta por vivir tranquilo en medio del bosque. Omega Ruby Le grandi ventole di Shiftry generano forti raffiche di vento alla velocità di 30 metri al secondo. La violenza del vento spazza via ogni cosa. Vive pacifico nel cuore della foresta. Omega Ruby 큰 부채는 풍속 30m의 강풍을 일으켜 무엇이든 날려버린다. 숲 속 깊은 곳에서 조용히 사는 포켓몬이다. Alpha Sapphire Shiftry is a mysterious Pokémon that is said to live atop towering trees dating back over a thousand years. It creates terrific windstorms with the fans it holds. Alpha Sapphire Tengulist ist ein geheimnisvolles Pokémon, das angeblich auf hohen Bäumen lebt, die Tausende von Jahren alt sind. Mit den Blätterfächern an seinen Händen kann es heftige Stürme erzeugen. Alpha Sapphire Tengalice est un mystérieux Pokémon vivant dans les cimes d’immenses arbres, vieux de plus de mille ans. Il peut créer de formidables tempêtes grâce à ses éventails. Alpha Sapphire Shiftry es un enigmático Pokémon que vive, dicen, en las copas de los árboles milenarios. Este Pokémon genera fuertes corrientes de aire con los abanicos que lleva en las manos. Alpha Sapphire Shiftry è un misterioso Pokémon che vive sulla cima degli alberi più alti, di solito plurisecolari. Usa le foglie degli arti superiori come ventole per generare terribili raffiche di vento. Alpha Sapphire 수령 1000년을 넘은 큰 나무 꼭대기에 산다고 전해지는 불가사의한 포켓몬이다. 잎사귀 부채로 강풍을 일으킨다. Ruby Shiftry is a mysterious Pokemon that is said to live atop towering trees dating back over a thousand years. It creates terrific windstorms with the fans it holds. Sapphire SHIFTRY's large fans generate awesome gusts of wind at a speed close to 100 feet per second. The whipped-up wind blows anything away. This POKeMON chooses to live quietly deep in forests. FireRed A POKeMON that was feared as a forest guardian. It can read the foe's mind and take preemptive action. LeafGreen A POKeMON that was feared as a forest guardian. It can read the foe's mind and take preemptive action. Emerald It is said to arrive on chilly, wintry winds. Feared from long ago as the guardian of forests, this POKeMON lives in a deep forest where people do not venture. Diamond By flapping its leafy fan, it can whip up gusts of 100 ft/second that can level houses. Pearl By flapping its leafy fan, it can whip up gusts of 100 ft/second that can level houses. Platinum By flapping its leafy fan, it can whip up gusts of 100 ft/second that can level houses. HeartGold It lives quietly in the deep forest. It is said to create chilly winter winds with the fans it holds. SoulSilver It lives quietly in the deep forest. It is said to create chilly winter winds with the fans it holds. Black By flapping its leafy fan, it can whip up gusts of 100 ft/second that can level houses. White By flapping its leafy fan, it can whip up gusts of 100 ft/second that can level houses. Black 2 By flapping its leafy fan, it can whip up gusts of 100 ft/second that can level houses. White 2 By flapping its leafy fan, it can whip up gusts of 100 ft/second that can level houses.